Fly Fox Productions: Mistborn: The Well of Ascension. Reviewed. Mistborn: The Well of Ascension. Reviewed. 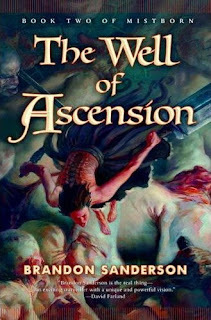 Well of Ascension is the second book in the Mistborn trilogy by Brandon Sanderson. First published in 2007, the plot is as follows: Our bands of heroes (those who are left) are now in charge of what was the capital of the Final Empire, armies are outside the gates, and the ever present Mists seem to be changing and becoming genuinely dangerous. When I reviewed the first Mistborn book a couple of months ago, I was blown away not by the story or the magic system or the genre/cliché-busting plot but by the characters. I found the characters to be wholly realized and fleshed out in a semi-literal kind of way. I loved almost every character, with Vin being one of the best-written characters and most realistic I had read in a long time. I compared Brandon Sanderson’s ability to highlight small actions that characters take as representative of their overall character to that of Aleksandr Solzhenitsyn in his book One Day in the Life of Ivan Denisovich , and while that comparison may be a bit of a stretch I still stand by the comparison. All this being said I did not like the character of Elend Venture in the first book. It took me a while to finish the Well of Ascension, I’m not sure why that it is, I started literally immediately after finishing the first Mistborn book, but somewhere along the line I put it down and picked other books up. Something in this middle volume did not hold my interest, I struggled to continue reading it. What was the problem? It was the same author; he used the same straightforward prose, the same easygoing narrative, the same setting. Was the plot just too dense? No it was fairly simple. Were the characters I liked gone? No only one was missing from the last book. I think I can highlight the problem, in one word Scholar. Scholar, this word is used in the series to describe Elend Venture, a character who I found fairly boring in the first novel, he had relatively little character development in the first novel and served mainly, I felt, as a way to interject the plot with a random element instead of something organically grown within the story as a whole. Elend is a bookish “scholarly type” who spent most of the first book schlubbing around in wrinkled clothes with a stack of books. A character that mistook the forest for the trees, he saw a grand picture but not the details of getting there. He didn’t really bother me too much in the first book, as he was not the main focus of the story. If the series had ended with the first book, it would have been a solid book with a complete but slightly ambiguous ending, and that would have been okay. But the series didn’t end. The second book (Like I have come to expect from Sanderson) took all my expectations and twisted them into a neat little bow. Specifically Brandon Saderson took the scholar Elend and molded him into someone who can apply his knowledge to each situation he finds himself in. Part of the novel felt rushed but maybe that’s a good thing it says something about a book when it feels like it went lightning quick and yet took months for you to read. What exactly it says I can’t really be sure of, but I think it might mean that Sanderson needs length, he needs breadth to show what he’s made of. This book was long over, 700 paperback pages, but it also felt short like so much of the implied could have been made explicit and by the time that I got into the story and finished the book I wanted that explicit knowledge. This was a good book. Will I compare it to one of the great books of literature? No, but that’s okay because I enjoyed it, regardless of its inability to maintain my attention it was well written and had a believable story arc and conclusion. This book took my least favorite character from the first book and molded him into a character I can enjoy, and that in itself is a wonder.